A crowd of homeless people gradually gathers outside the fence waiting for their dinner. "Cinema for the homeless" was born in the summer: the homeless were shown French film 1+1 and classical Soviet comedy Operation Ы. The screenings are organized by volunteers from the Friends on the Street Movement, which since 2002 has been helping people without a home of their own. The movement feeds them, helps them socialize and carries out various events. The Friends on the Street Movement's main principle is that the homeless are ordinary people who have just been unluckier in life than others. We meet Natalya Markova, one of the movement's coordinators, near Moscow's Yaroslavl railroad station and walk towards the facility where emergency social assistance is given, and where the films are shown. Both the volunteers and the homeless have already assembled at the premises and are happily chatting with each other. These homeless people are among the organization's old acquaintances. Some of them have known the volunteers for several years and have indeed formed strong friendships. "How are things, Masha?" Natalya affectionately asks a short swarthy woman in a shabby sports suit. "Very well, thank you," Masha responds. "Which film will be shown today?" The assistance facility is a platform that is surrounded by a green slatted fence, inside of which there is a large white tent. A few people in 'Social Patrol' uniform, from the Department of Social Protection of Moscow's Population, greet us. 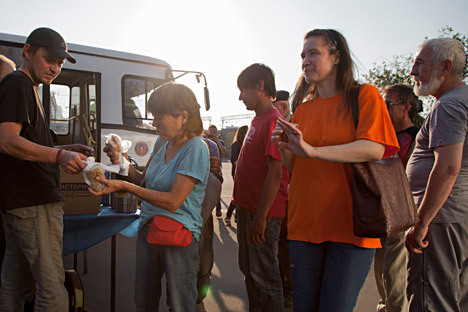 Here volunteers provide the homeless with food and drink and show them the films. Before the film the volunteers organize a buffet. Together with their homeless friends they carry tables out of the tent and organize a food distribution point. The menu consists of bread, vegetables, plov (Caucasian/Central Asian pilaf usually with lamb), buckwheat, tea and mineral water. A crowd of homeless people gradually gathers outside the fence waiting for their dinner. Some of them come only to eat. They sullenly push their way onto the platform. They are permitted to enter slowly, in small groups. A volunteer tells me that those who curse or behave aggressively are refused entry or sent to the back of the queue. One homeless man with a beaten-up face covered in bandages enters last because he had tried to push in front of others. Having eaten, most leave and only a minority remains to watch Groundhog Day. The cinema lovers go into the white tent where they sit down on the chairs provided. The volunteers position a computer to project the film onto the tent wall, which serves as the screen. Then Bill Murray's face appears. "The idea for the movement was created by a group of friends who decided that it would be great to help other people," says Andrey Volkov, another coordinator of Friends on the Street. "Walking around outside and getting to know the homeless, we understood that they have a very difficult life. One aspect involves the constant need for food and clothes, which we help them obtain - we bring them hot meals, tea and when it's cold we give them clothes. We buy all this with our own money. But besides this, the homeless are in great need of simple human communication, warmth and friendship. That is why we hold these events - soccer and now film screenings." "When I found myself in difficulty - my husband was beaten up…. I called Andrey and told him, 'Well, yeah, that's how it is, we're on the street, help us out,' and they really helped us. It’s not even that they feed us - many organizations can do that. They communicate with us, support us morally. This is very important. I used to drink a lot. They helped me stop. I also stopped stealing. Now I also try to help them." While we are speaking one of the guests, who has just finished eating, starts causing trouble and shoving the others. A few burly fellows from Social Patrol immediately approach him and he is escorted outside the fence. "Sometimes people who are drunk come here and start acting rudely," Volkov sighs. "But I think that this is not the problem of the homeless, this is the whole country's problem. But obviously people who have found themselves on the street have it hard. Not everyone in such conditions can be psychologically normal." Gradually the number of viewers in the tent reduces and no more than ten people are left watching Groundhog Day. "The idea of the film screening is wonderful," says homeless man Yury Sergeevich, "the only thing was that you couldn't see well. And then, as you saw, most people only watch the beginning and then leave. I think that the audience should select the film. For example, we would love to see Wedding in Manilovka (a Soviet comedy from 1967). I am convinced that this place would be packed. And if the screen was better, that would really be great." It is difficult to provide a precise number of homeless people living on the Moscow streets. According to various estimates, the number is in the tens of thousands. - The Department of Social Protection of Moscow's Population helps non-Muscovites who have found themselves without money and documents to return home.